Hopefully, dear readers, you are all familiar with Stacie Pryor's blog Sheek - if not, add it to your bookmarks! It's a great blog for fashion and home decor, and Stacie does a wonderful job of sharing great finds from all over the grid. She's also now branching out as a content creator, which I think is awesome :) and so today I share with you [SPRY] and Stacie's first prefab, the get lost/get found skybox. I love the mix of light/dark shingles on the outside, and the triple french doors are darling! For a first release, this skybox is really quite awesome. Lots of character, great mix of textures, and still just simple and cozy. I really like having the fenced-in patio, too - that's a great touch on a skybox. Inside is a single open room, with two (!) window seats. I love window seats! I have also always been a huge fan of transom windows (I think since my elementary school days - it was an older building and all the classroom doors had transom windows - it was love at first sight) so I love that Stacie used those with her french doors. And don't get me started on my love for french doors, seriously. The lanterns are included as cute little exterior details, as well. 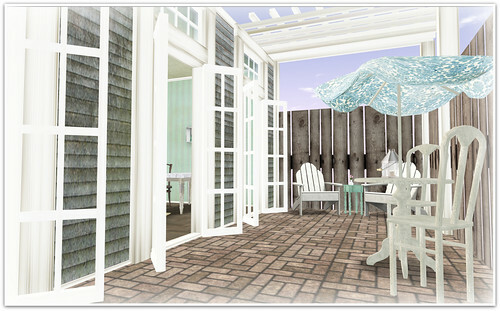 I didn't play dollhouse for this post, mainly because Stacie decorated the skybox for her own blog post, and her pics are awesome. :) So, be sure to check out her post at Sheek. The get lost/get found skybox is only available on XStreet, right here.